We first met Chaz Bojorquez while creating the award-winning hit short documentary "LA Aboriginal" on dynamic artist, Dave Tourje. Having just moved to LA from NYC we were committed to showing in a film that Los Angeles had a rich art culture, style and compelling world of its own. Dave made the movie easy because in addition to being a powerful character, he was a sort of walking encyclopedia of LA art and cultural history and brought such great understanding to our purpose. Dave had grown up in Highland Park and we were fascinated that Chaz was from the same neighborhood but the two had never met until much later in life. They were both into surfing, hot rods and graffiti and were living parallel lives. When I, Daniel, was a young skateboarder living in South Pasadena, it seemed that there was danger everywhere in the early 90's in nearby Highland Park. I would feel a certain terror when I skateboarded there with my friends. So Dave's stories during the filming of "LA Aboriginal" about being chased by guy's swinging motorcycle chains was so real to me. To think that Chaz was there way back in the day, influenced by the gang culture there and creating images in the LA River and conceiving his legendary Señor Suerte was fascinating. Señor Suerte later became tattooed on the necks of gang members and Chaz certainly "burned a whole with his images into the culture" as Dave would say showing that he was indeed influential. Meeting Chaz gave us a whole new context and appreciation for Highland Park, LA art history, gang culture and graffiti in general. It was when we interviewed Chaz during his seminal "Art in the Streets" show at Moca that we really discovered as filmmakers the true depths of this fascinating artist. It was shocking and amazing to discover that Chaz had worked for decades before really attaining the respect in the art world he deserved. This amazing creator was actually painting in the LA River alone with no real audience or appreciation for his work for unbelievable stretches of time . I think most artists would have given up because don't all artists really want validation or acknowledgement for their work? Chaz persisted for years despite his work being called "garbage art" and even rejected by the Chicano Art Movement. So being fascinated by Chaz, we invited him onto our new inspirational show "The Dream State" to talk about his journey. Having him on the show is a rare gem because we learn from one of the greatest creators how to build a career, how to overcome obstacles, how to promote one's work and perhaps most importantly, Chaz gives us a life changing definition of success-"Success is being influential." This blew us away in the context of a culture centered around money, fame and material success. This is the beauty of "The Dream State", we learn from legends what really matters that can help one achieve one's dreams and goals in art, film, fashion and creativity. 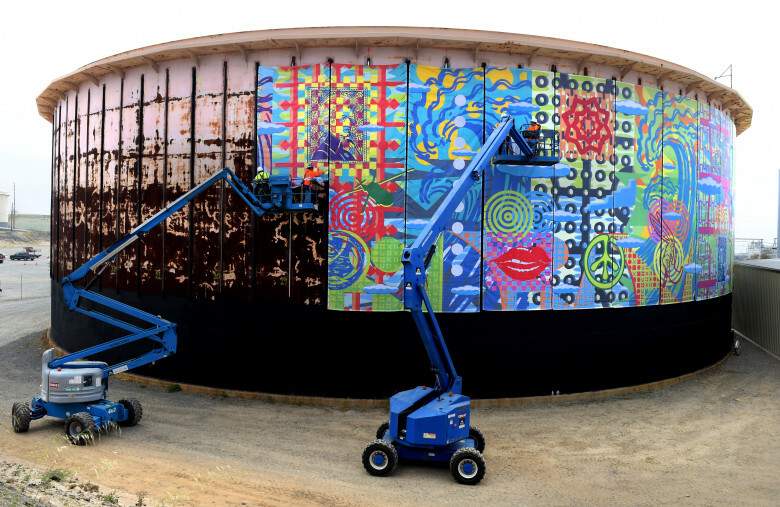 What was once an unsightly rusted out water tank in El Segundo has become the backdrop for a stunning mural by legendary artist John Van Hamersveld. 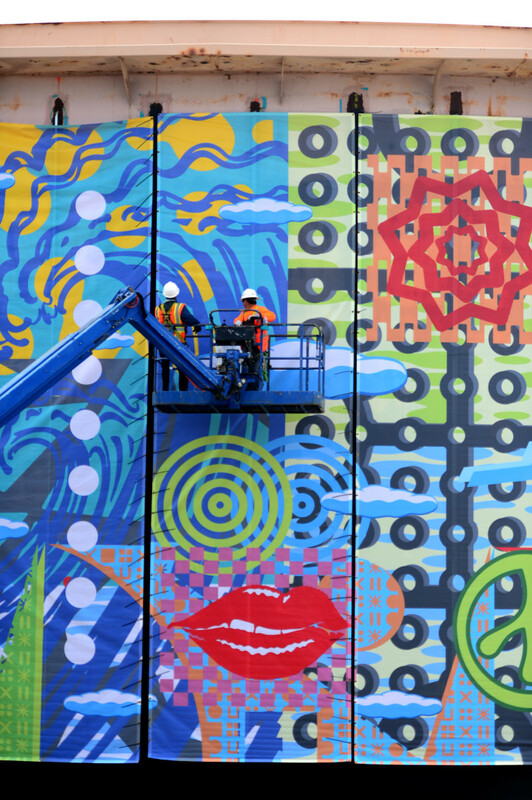 The artist and a crew of workers were busy this week erecting 51 giant 32-foot tall sections of the colorful mural that will stretch clear around the water tank 510 feet in circumference. An unveiling ceremony will take place Saturday, April 28. The work, commissioned by the Department of Water and Power together with the City of El Segundo, came together as a way to beautify what had become an eyesore, said El Segundo Mayor Suzanne Fuentes. 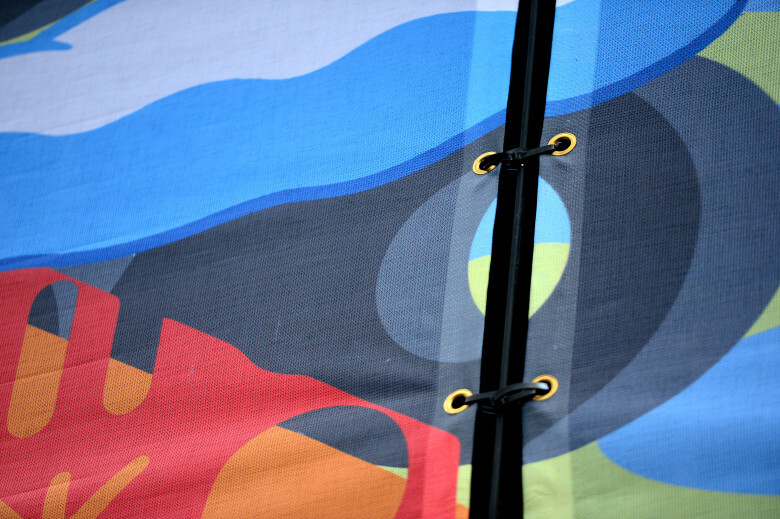 The mural, in classic Van Hamersveld fashion, depicts California surf culture in solid strokes of colored images placed together in a computer generated collage. Best known for his creation of the Endless Summer movie poster, Van Hamersveld is well-known for many other iconic images including the album cover to the Beatle’s Magical Mystery Tour. While he has created large murals before, such as one in Hermosa Beach on 14th Street, and the frieze surround on the Manhattan Art Center in Manhattan Beach, the El Segundo water tank represents his biggest project. Van Hamersveld said he was inspired by his formative years growing up in El Segundo and wanted to pay homage to local surf legends Hap Jacobs and Dale Velzy. A graduate of El Segundo High School in 1959, Van Hamersveld was inducted last year into the school’s hall of fame. It was there during the ceremony that he was approached about creating the mural on the water tank. Printed on mesh, the 360-degree mural is attached to the rusted surface using a giant frame to which each panel is then attached. As each panel went up this week, Van Hamersveld said he could hardly contain his excitement. “I have to watch like three cowboy movies just to calm down,” he said. 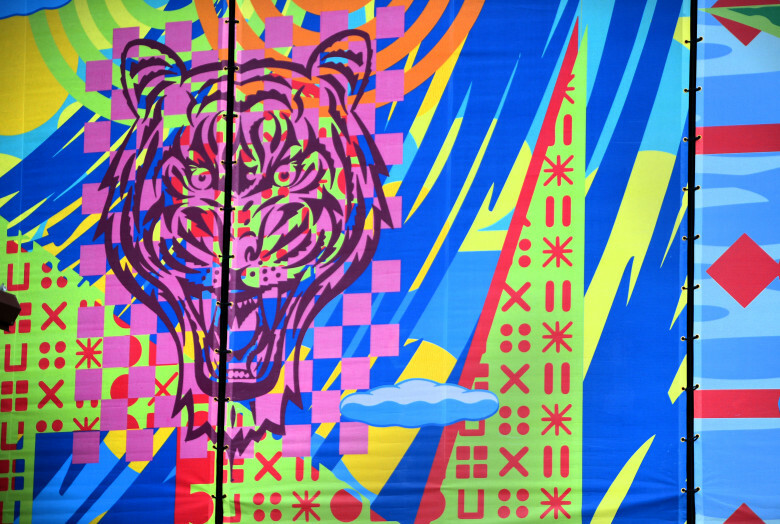 Fuentes said the mural, visible along Grand Avenue and presumably by airplanes passing overhead from LAX, is already creating a buzz around town. The Somos Locos Book is now available! Los Angeles, CA — EASTERN PROJECTS Gallery is pleased to present a group exhibition of contemporary and legendary SoCal artists rooted in the diverse subcultures of Surf, Skate, Graffiti, Low-Brow, Tattoo, Hot Rod, Lowrider and Music. Curated by Chaz Bojórquez. The CALIFORNIA LOCOS original core group of five contemporary and legendary artists include Chaz Bojórquez, Dave Tourjé, John Van Hamersveld, Norton Wisdom and Gary Wong. The CALIFORNIA LOCOS represent a living West Coast lifestyle. For the last five decades, each LOCO has created their own distinct and recognized style, built out of the kaleidoscope that is the West Coast experience. “CALIFORNIA LOCOS: SOCAL ORIGINALS - MASTERS OF STYLE” exhibits their continued contributions to the West Coast culture by expanding their core membership to include works by Mister Cartoon, Shepard Fairey, Estevan Oriol, RETNA, SLICK and Robert Williams. Every art scene is led by an originator, a style master of his art and trade. These influential Masters are honored in this show for their life dedication as “true” creators, real pioneers that are now internationally recognized for their work. The CALIFORNIA LOCOS have evolved into a movement which reflects the multicultural fabric of Southern California and it’s subcultures that have resonated worldwide. In true LOCOS style, opening night will feature a Lowrider by Mister Cartoon, Hot Rod by Dave Tourjé and a new Dusters California X CALIFORNIA LOCOS skateboard release. This first of its kind show of SoCal Masters promises to be a historic classic, opening Saturday, September 16th at Eastern Projects in LA’s Chinatown. Copyright © California Locos. All Rights Reserved.